Frozen shoulder is a relatively common disease of the shoulder affecting both men and women in their middle years. It usually occurs for no reason that we understand. It is probably a genetic disorder with an environmental trigger. It only ever occurs once in a shoulder although 15% of people will get it in the opposite shoulder as well. The shoulder is a ball and socket joint and the ball is held in the socket with the help of a relatively inert and loose sac. This allows the shoulder to move in all the directions that it normally does. In frozen shoulder the sac is affected in two things. 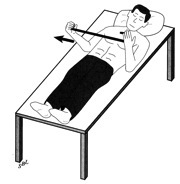 Firstly, it shrinks thus restricting the movement of the shoulder in all directions. Secondly, it becomes very inflamed like a fresh graze so that when a patient attempts to move the now tight shoulder, this stretches the raw lining causing great pain. Frozen shoulder is a condition which as stated comes on for no reason (although patients often attribute it to a specific event). The condition is self limiting, that is to say it cures itself but it takes some time to do this. Frozen shoulder cures itself between eighteen months and three years after its onset. For patients who can manage with their symptoms during that time there is no need to have any treatment. It is not an arthritic or progressive condition in any way and almost always burns itself out, with full recovery of movement and function. It is important that the diagnosis of frozen shoulder be made because sometimes it can be confused with other shoulder conditions which are treated in a different way. Some people name any shoulder pain as “frozen shoulder” which would obviously be inaccurate and unhelpful. Frozen shoulder is a very specific disease and is completely different from for example, tendonitis or arthritis. Patients should undergo an x-ray or an ultrasound of the shoulder to rule out disorders which can mimic frozen shoulder. The treatment of frozen shoulder is directed to the two principle symptoms. Pain is the biggest problem for most patients. They feel the pain during the day, during sudden movements and of course at night where sleeping is very difficult. The pain can be damped down with tablets such as Paracetamol or anti-inflammatories such as Nurofen and prescription versions such as Voltarol. Unfortunately, these are often not strong enough to quell the pain. The pain is extremely well treated in most cases with a cortisone injection. It is unusual for this to have to be repeated before six months, if at all and often gets people out of this dreadful pain and allows them to sleep well at night and start to lead a more normal life. There is no evidence that there are significant side effects from a single cortisone injection into the shoulder for frozen shoulder. The administration of the injection does give rise to a sharp, unpleasant pain for a few seconds. Occasionally patients have some pain during that day and the next day or two but this is unusual. Very occasionally a patient may develop a rash on the upper half of the body for thirty six hours. Diabetics will notice that their blood sugar levels rise for twenty four hours but then come back to their usual level without treatment. Many people can live with a painless stiff shoulder but measures are attempted to try and resolve the stiffness too. The main measures are a personal exercise stretching programme or a programme supervised by a physiotherapist or osteopath. The aim is to stretch the tight shoulder and it is a “no pain no gain” scenario. While the shoulder is acutely painful however it is best to wait until that pain can be damped down. Patients make progress with stretching in the first few weeks and there is seldom much point in persevering with a stretching regime for more than six weeks. Some frozen shoulders are so tight that the stretching just does not work. In that scenario, the patient has two choices. Firstly, to wait for the condition to burn out over the eighteen months to three years as already promised, or secondly, to consider other treatment. This is a treatment where a needle is placed in the joint and local anaesthetic put in to numb it. Then extra fluid is injected into the joint to inflate the contracted sac. This takes about 15 minutes and is done in the X-ray department to monitor the stretching. It is quite effective but not as effective as the surgical option reported next. Surgical treatment is available for any patient who has tried all other methods and has had enough of their frozen shoulder and does not wish to wait till the condition resolves on its own. Surgical treatment consists of an arthroscopic release of the tight shoulder capsule. Under general anaesthetic and arm block, a camera is placed in the shoulder and a tiny pair of scissors is also passed into the shoulder which is then used to divide the tight part of the shoulder capsule. Patients always regain significant movement from this procedure. 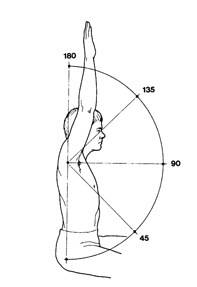 The movements of the shoulder are known as flexion where the arm rises up in front of the chest as if reaching for a high shelf; abduction where the arms rises from the side of the body like an aeroplane wing; external rotation where the arm moves away to the side of the body, for example when putting one’s arm in a jacket; and internal rotation when one tries to scratch one’s back. Arthroscopic release is excellent for the restoration of both flexion and abduction, pretty good for the restoration of external rotation but least successful for internal rotation. It is this last movement (internal rotation and scratching one’s back) which is always the hardest to get back in any treatment and the last movement to recover. The arm block mentioned above is an anaesthetic procedure which makes the arm go to sleep for around sixteen hours so that when the patient wakes up from their operation they have no feeling or pain in the shoulder. This permits active mobilisation by the therapist. Patients stay in hospital for one night and then have daily physiotherapy for the next week before continuing an exercise regime over the next month. By a month from the operation most patients have regained a marvellous range of movement and describe “having their arm back”. The patient satisfaction rate of those who do take the plunge and have the arthroscopic procedure is very high. What can go wrong with the surgery? In the past surgeons only manipulated the shoulder and rarely when too much force was used, gave rise to shoulder damage. Arthroscopic release has dramatically reduced this risk. There are unfortunately some patients who develop a recurrence of their frozen shoulder within two or three months of the release but again this is rare but possible and “one of those things”. Treatment is possible to alleviate that too. By and large one waits till the shoulder is less angry and then attempts a re-release. In summary a frozen shoulder is a very specific condition characterised by both pain and stiffness. Treatments including tablets and a cortisone injection are used to damp down the pain so that a stretching regime either done by the patient alone or supervised by a physiotherapist can help regain the range of movement. For patients who do not respond adequately to that and who cannot wait the eighteen months to three years for the condition to burn out on its own, then arthroscopic keyhole release of the shoulder has an excellent chance of restoring an almost full range of movement and abolishing the pain. With each exercise, hold end position for five seconds. Repeat each exercise five times in a block. Repeat each block a minimum of three times per day.